Sometimes, especially when you’re a teenager, you’re just too young to know. I grabbed All Shook Up out of the el cheapo cassette bin at The Wiz sometime in the fall of 1988, certainly within that doldrums stretch where the summer is irrevocably gone, and the holiday season is still just out of reach. It made for a perfect juxtaposition: a disappointing album for a disappointing season. At fourteen years old, my take on All Shook Up was simple: first song amazingly great, rest utter crap. Okay, to be fair, I thought “High Priest of Rhythmic Noise” was, well, okay, and that “I Love You Honey But I Hate Your Friends” had a cool, funny title, but wasn’t actually very good. In what will probably come as no sort of plot surprise, All Shook Up is the Cheap Trick album I have most reversed my opinion on in the twenty-three years since I first gave it a listen. At the time, though…well, let’s just say that I figured I knew exactly why Tom Petersson left the band before this bomb dropped. I agree with my younger self on two of the above points: opener “Stop This Game” is one of the truly great Cheap Trick moments, and “I Love You Honey But I Hate Your Friends” is a better title than a song, although I now get all the Rod Stewart/Faces references in the music to enjoy the joke more than I did then. Actually, that last point is the key to it all, in a way: having heard so much other rock and roll of varying styles since 1988, I now hear the tremendous musicality just beneath All Shook Up’s surface. True, you’ve got to push past what seems at first like a fairly large degree of chaos to get there, but it’s very much worth the effort. Few albums are as well titled as All Shook Up, and few better reward a listener’s initial patience with more buried treasure. Most contemporary criticism of the album points to the plodding ballad “World’s Greatest Lover” (in typical Rick Nielsen fashion, this corny title is attached to a song written from the point of view of a soldier in a wartime foxhole) as the album’s other highlight. I don’t really agree: the song itself is monotonous and a touch tuneless, but it is home to a staggeringly brilliant, lyrical guitar solo that really makes you wish the rest of the song would rise to its level of brilliance. Still, the relative tranquility of that song makes sense as the ultimate release from a first side that simply keeps building in brashness and volume, deploying what initially seem like simple enough ideas as funhouse mirrors that never quite seem to show you what they are. Both “Baby Loves to Rock” and “Just Got Back” seem like ‘50s pastiches at first blush, but eventually the sexual tension of the former and apocalyptic dread of the latter, not to mention the loud metallic sheen of it all, are enough to make the listener wonder what the hell is actually going on here. These songs are among the album’s more conventional material; don’t say you weren’t warned. Side two Is where things shake up for real: “High Priest of Rhythmic Noise” is chaos incarnate, a cacophonous wall of noise that will eventually prove either irritating or compelling – if not both at the same time – given enough repeat listens. The Bon Scott tribute “Love Comes a-Tumbin’ Down” is one of the hidden gems of the Trick catalog: a high-octane epitaph for a high-octane man, and one that mourns a friend without ever kidding itself about what killed him. “Go for the Throat (Use Your Own Imagination)” recasts “High Priest…” as melodic noise, sacrificing none of the former’s chaotic swirl in search of a catchy chorus. The entire mess ends with “Who d’ King”, a drum solo plus chant, a complete non sequitur…and likely the only way this unique, strange platter could actually spin out. I’ve come to love All Shook Up for what it is: the noisy, idiosyncratic flip side to “I Want You to Want Me”’s coin. 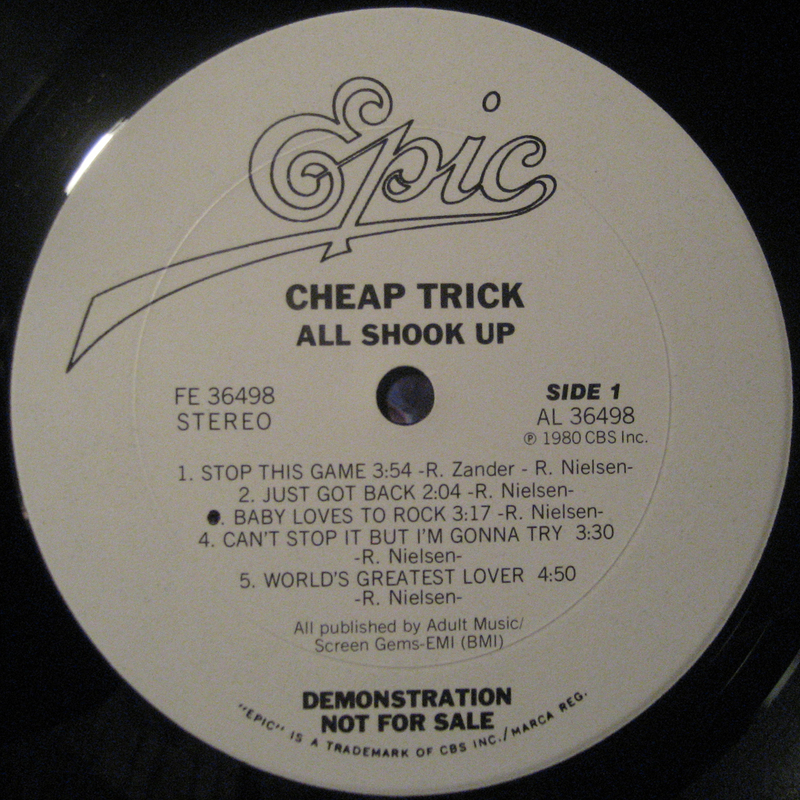 While I’ll always assert that Cheap Trick’s best material falls squarely between the two extremes, it is fascinating to hear them indulge their artsy, chaotic side for an entire album with no audible regard whatsoever for commercial viability. It’s also amazing to me that this album was released as-is back in 1980. I’d love to have seen the looks on the faces in the Epic Records ballroom upon first playback of this material: the label’s power-pop golden boys, produced by George Martin of Beatles fame, came up with…this?! The album went gold on Dream Police’s momentum, stopped selling one people actually heard it, and the band’s career was, commercially speaking, never really the same after that. Was it bold or foolhardy of Cheap Trick to allow art to flip the bird to commerce at such a critical juncture in their career? It’s all in the eye of the beholder, I suppose. All I can really tell you is what I’d love to tell my fourteen year old self if I had the chance: All Shook Up is one hell of a trip, once you get used to the turbulence. "That's How She Answers the Phone." The Re-Rip Chronicles: Jellyfish, "Bellybutton"